Bob Bonkers, also known as Bob Baker, started his career as a Registered General Nurse in Kent in the late 1980s. 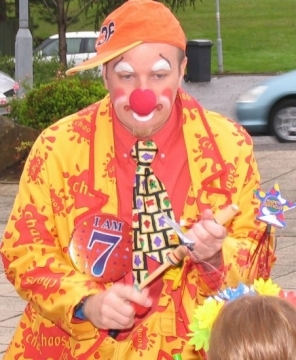 It was while completing a diploma in children’s nursing at Great Ormond Street hospital in 1999 that Bob discovered the benefits his unique brand of fun and magic had on the children in his care. Following a move to the Midlands it was not long before Bob was asked to entertain a group of children at a birthday party for a colleague, and Bob Bonkers was born. Bob Bonkers reputation for fun, laughter and lively professional children’s entertainment soon spread, and so did his list of satisfied customers. Including companies such as Michelin, Stoke City Council, 10 Pin Bowling, The Lowry Shopping Centre, North Staffordshire NHS Trust, Scotrail and Scottish Power. It was at this point that Bob began working with the Theodora Children’s Trust as a hospital clown doctor, providing fun and laughter to children undergoing treatment in Manchester and Sheffield children’s Hospitals. This amazing experience lasted 3 years until Bob moved to Scotland. Bob has also been involved in designing specialist children’s magic effects with Razamatazzmagic.com and giving talks on entertaining children for hospital staff and fellow magicians. Since moving to Scotland Bob became a member of the Association of Children’s Entertainers for Scotland, and was also a member and subsequent treasurer of the Glasgow Magic Circle. He has won the Glasgow Magic Circle Children’s Magicians Award on several occasions, most recently for 2012 to 2013. Bob Bonkers now lives in Glasgow and entertains children in Glasgow and the surrounding areas from Ayr to Dunblane and Lanark to Largs. Plus many more events and private parties. Bob Bonkers carries an Enhanced Disclosure Scotland certificate, full liability insurance and all equipment used is PAT tested.